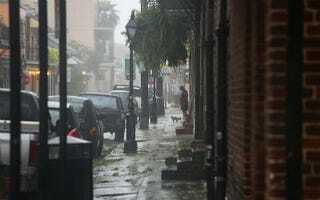 The hurricane, which made its second landfall early Wednesday, was moving very slowly, at about 6 miles per hour near Houma, La., according to the National Weather Service, bringing with it the heightened risk of tornadoes and flash flooding hundreds of miles inland from Louisiana, and across Mississippi and Alabama to Florida. In Plaquemines Parish, about 95 miles from New Orleans and where the hurricane first made landfall, water "overtopped" a levee, causing extensive flooding, according to the National Weather Service. The levee is not one of the large, federally maintained earthworks lining the Mississippi River, but a locally maintained levee some 8 feet high, and lower than the 12-foot surge that hit it, according to officials from the Army Corps of Engineers.